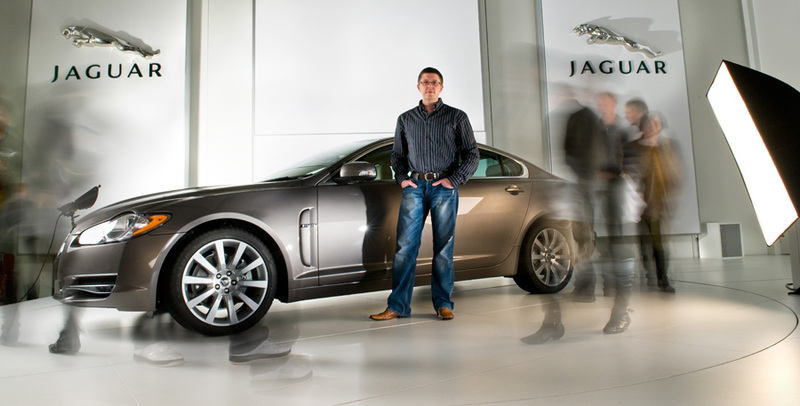 This week Ambient Life Photographer Tim Wallace held the first of a series of seminars for the UK prestige car manufacturer, Jaguar. The event was held in their main headquarters at Castle Bromwich. Tim was invited some months ago to conduct a series of seminars on car photography by Jaguar, and following a great deal of planning and organisation from the supporting groups such as Hasselblad, Nikon, and Bowens, we were delighted with the wonderful feedback from both Jaguar and the attendees on the first of what we believe will be many events of this type. On Saturday the 11th October Ambient Life Photographer Tim Wallace held the first of a series of seminars for the UK prestige car manufacturer, Jaguar. The event was held in their main headquarters at Castle Bromwich. Tim was invited some months ago to conduct a series of seminars on car photography by Jaguar, and following a great deal of planning and organisation from the supporting groups such as Hasselblad, Nikon, Bowens and Calumet we were delighted with the wonderful feedback from both Jaguar and the attendees on the first of what we believe will be many events of this type. The event started at 10:30am and ran the course of the entire day with introductions being made by John Maries, Executive Director at Jaguar. Following an initial 20 minute talk by Tim on the aspects and issues surrounding commercial car photography today the attendees had chance to watch Tim perform a live shoot with a Jaguar on stage in Jaguars main auditorium shooting with both Hassleblad and Nikon equipment. The event continued where the car lighting set up was changed several times to give viewers an opportunity to see how differing light arrangements effect the subject. With the excellent support of Hassleblad, Nikon and Bowens the group were then able to get a chance to shoot with the equipment themselves under Tim's guidance and advice. "I just wanted to say that I thought the event day was superb and your hard work and organisation really paid off. For me, the day flowed seamlessly along and enabled everyone to enjoy it. Thank you. Please send my thanks, also, to the vendors. The combination worked brilliantly. Even I enjoyed the chance to try out some exotic kit! The students will, I am sure, be talking about their day for some time. Thanks to you, they had a unique opportunity to work in a professional environment. I was especially pleased to see them engaging with the older cars. As a sign of your success. I have to tell you the Finance Controller is still buzzing, this morning, and has five images on his wall, already! Favourite words from the day, "Leather! Who's photographing the leather?". I've spoken to all the groups which I brought on Saturday for their feedback, and I'm delighted now to tell you how much they all really enjoyed the event. For myself, I want to say how much I appreciated the patience and attentiveness with which you treated my students, from the youngest to the oldest. Particular thanks for helping to put the less experienced ones at ease: some of them have only been with us for a few weeks, and your kindness towards them really made them feel part of the proceedings. We were all very impressed with the presentation you made at the start of the day. I had already introduced the students to your work through your website before we came, but it made even more of an an impression when they were able to speak and work with you in person. I want to thank you also for the amount of work which you clearly put into this event before, during and after the day. It's been a very memorable experience and the most rewarding event we have ever attended. "I think the event is really great and its good to see people coming to grips with the different bodies available through Hassleblad, these are in effect our customers of the future. It was great to meet Tim, a down to earth bloke who made me laugh and connected to the audience really well"
"I have to say that this was a really great event and I for one thoroughly enjoyed being able to work with all that attended. We had originally planned to get everything set up across the 2 stages by close of play on Friday afternoon however we ran into some power issues, as sometimes happens, and needed to return at sunrise on Saturday to get everything completed in preparation for the opening. This just would not have been possible without the really fantastic hospitality of Jaguar and the enthusiastic support and professionalism of the supporting vendors. A special thank you to Paul and Ben from Hassleblad for being on hand and really helping things flow smoothly, not to mention the amazing amount of work by David France from Bowens and his assistant Dave. We had a tremendous amount of lighting equipment to cope with, quite literally a lorry load of the stuff, and the guys worked incredibly hard to ensure we got the results that we were looking for. Thanks also to the guys from Nikon fro their superb dedication to the event and for their countless hours of assistance to those wishing to learn more about the equipment. Finally I'd like to give my thanks to Frankie from Calumet, an extraordinary young lady that helped to pull the whole lot together and ensure we all had what we needed whether it was sending somebody out for another extension cable or the bacon sandwich that she brought in for me early on the Saturday morning, thanks Frankie you were outstanding!" "After the event I had over 30 e-mails and text messages regarding the event and was delighted with the response from all those that attended. It was really great to be able to inspire people in this way and here at Ambient Life we are already looking forward to the next event in November"